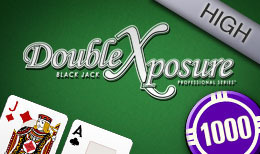 Double Exposure Blackjack™ is a classic Las Vegas card game. The big difference to traditional blackjack is that the dealer cards are given face up. With even money payouts on all player wins and variable speed card play, this game is sure to attract the attention of new Blackjack players on our best casino UK. We recommend you to visit Dream Jackpot for more online casino games.